One time Katie and I were hanging out with our friends and we were going to make dinner together, we all split up to get the different ingredients, mine was italian bread because we were making spaghetti. 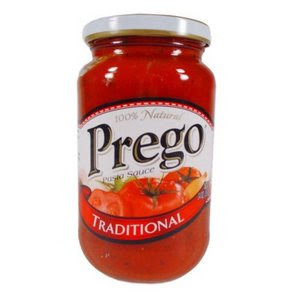 When Kim and Grace came back with a jar of Prego, I thought they were joking, so I laughed like "OK, where is the REAL jar of sauce that we will actually eat?" but they were serious. I couldn't believe it, responding very graciously, as I am known for, I led them back to the sauce aisle, and showed them the acceptable options: Bertolli or Newman's Own (except for the italian sausage and peppers variety). They asked about Ragu as an alternative, but thy could see by my face that they should probably just drop it. ( Classico is passable in a pinch if you have a lot of extra spices and garlic at home to give it more flavor.) Once we had the sauce, Bertolli (5 cheese), we headed back to the house. Once they actually tasted the Bertolli, their jaws dropped in collective wonder, and they apologized for trying to force low-grade sauce onto the group. We then forgave them according to the principles found in Matthew 18. Man, I remember that night like it happened yesterday. Anyway...My point is that Katie is pregnant, and I think I want some spaghetti now. Shut up about spaghetti! We are so EXCITED for you guys! I'm so happy that you saw the little 'flutter'... Now you can breath and just enjoyed being pregnant. I'll still be praying for you both, for whenever those anxious moments hit. Yay Katie! I'm so excited for you! I'll keep you and Sean and baby in my prayers! Oh yeah... I forgot to make a 'nest' comment. Now the nest finally has a baby egg! Hope momma bird is feeling well. YAY!!! How exciting! WE will be praying for you! Love you! Whoa, Fertile Mertile over there. Yay! Yay Yay! I was hoping that was where the Prego talk was going!! We'll be praying for you ALL!! So very happy for you, Katy and Sean! We'll be praying for you. Yay! Praying for you both and the baby. That's the best news!!!! I'm sooo happy and excited for you! So excited for you Kates and Sean..and also sooooooooooo glad that you are back in our neck of the woods..we needs babies to spoil around here! yay!! i am thrilled for you, Sean & Katie!! will be praying that all goes well! ha ha!! i remember that day too oh so well. we were at harris teeter. and i totally remember that disapproving Sean face of yours when kimmie and i brought our spaghetti sauce pick. your influence has not worn off on me though. i still go for the RAGU. It is cheap!! oh, and you know i will be aunt gracie, right?